Rachel Bournival has been volunteering at Eagle Valley since 2004 and has been on the board since 2005, and serving as Board President since 2006. Rachel produces the center's Monthly Newsletter, and is actively involved with rescuing injured and orphaned Birds of Prey for the center. 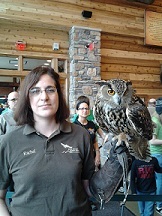 Rachel obtained her certificate of completion for Wildlife Rehabilitation from the International Wildlife Rehabilitation Council's course in 2005. She has a B. S. Degree in Zoo Science from Friends University. Rachel also helps foster cats and dogs for PALS Animal Rescue.